Alvin C. York was perhaps the best known American soldier from World War I. A backwoods farmer, York attempted to avoid serving in the army as a conscientious objector. 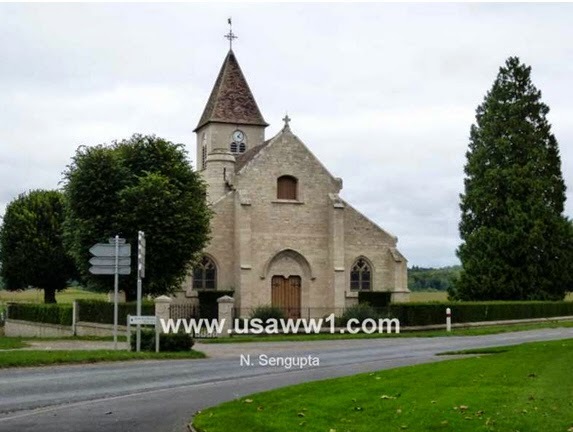 Finally convinced to serve by his commanding officer, on 8 October 1918, he was part of a small squad tasked with outflanking German positions in the Argonne Forest that were holding up a major American attack. 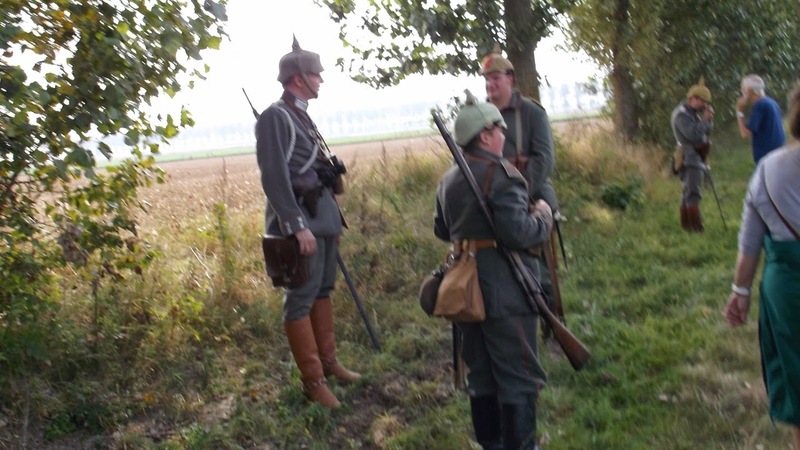 The squad successfully worked behind the German positions and surprised a number of German soldiers who were eating breakfast. 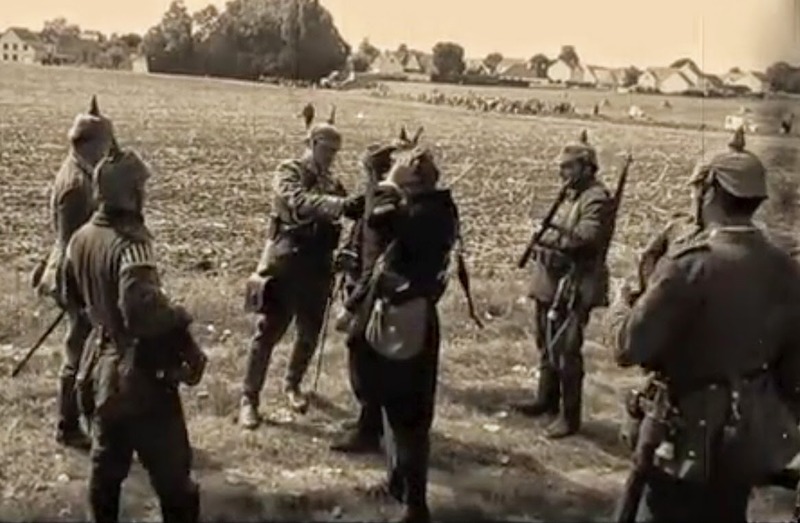 The American squad took the Germans prisoner, and included in the catch was the officer in command of that sector of the line. 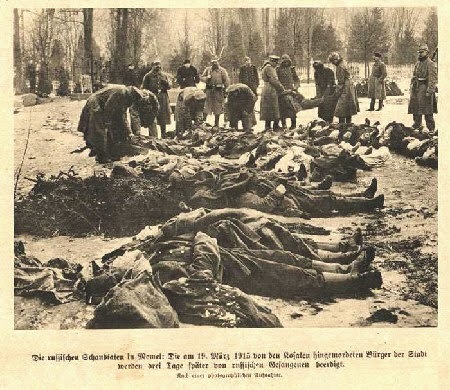 Other German troops saw what was happening and opened fire, killing and wounding over two-thirds of the American soldiers. York, then a corporal, was the senior non-commissioned officer left, and he took charge of the squad. An expert marksman, York then shot so many of the Germans firing at him that the captured German officer finally ordered his men to lay down their guns and surrender. York also repulsed a bayonet charge by a dozen Germans. He and the handful of American survivors led the prisoners back toward the American lines. On their way, York coerced the officer into ordering another German unit to surrender, so that when they finally reached the American lines, the small squad had in its possession 132 German prisoners. Word of York's action spread when a reporter for the Saturday Evening Post publicized his exploit. York received the Congressional Medal of Honor and the Croix de Guerre from France. He was greeted as a hero upon his return to the United States. After many years of refusing to profit from his war service, in 1940 he was convinced to allow a motion picture about his life, which became the movie Sergeant York, starring Gary Cooper. It was a hit, the top grossing movie of 1941, and earned nine Academy Award nominations. The movie brought the details of York's life to a new generation of Americans. Subsequent generations were then exposed to York's story when the movie was re-run on television over the years. 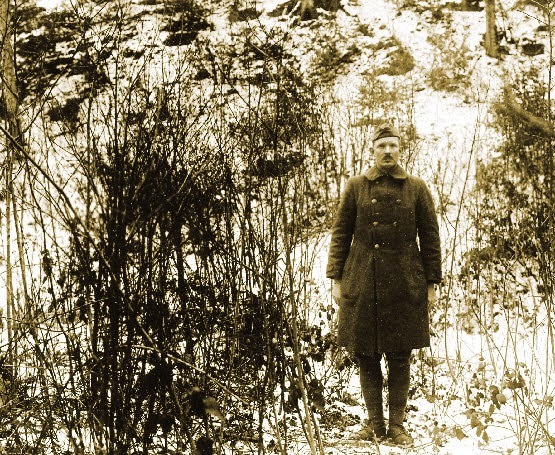 About a decade ago, two competing teams entered the Argonne Forest hoping to locate the exact site of York's heroic exploits. One team, taking the name "The Sergeant York Project", was led by two American professors from universities in Tennessee and a British historian and tour guide. The other team, calling itself "The Sergeant York Discovery Expedition", was led by a U.S. Army officer stationed in Europe. Both teams combed through source information for details of the York action. Both employed metal detectors to excavate their chosen sites and to recover artifacts from the 1918 fighting. Both found items that they say support their choice for the site of York's fight. Unfortunately, the two sites are about a half mile apart on the southeast edge of the Argonne Forrest. Both teams are 100 percent sure they have found the right location, and both are equally adamant that the other team's choice is erroneous. At times the discussions between the two groups have become acrimonious, as one group maintains the other conducted its archeological search without authorization or without following proper standards. Eventually, French authorities accepted the findings of the "Sergeant York Discovery Expedition" and authorized placement of historical markers at their site. Since then a Sergeant York Trail has been constructed. The U.S. Army Center for Military History has endorsed this team's work and is in the process of displaying some of the artifacts recovered from the site. Alvin York: A New Biography of the Hero of the Argonne was written by Col. Douglas V. Mastriano, the leader of the "Sergeant York Discovery Expedition". Col. Mastriano has given us a very coherent and readable account of the life of Alvin Cullum York from his hell-raising days of drinking and fighting in bars on the Tennessee-Kentucky border, to his life-changing conversion to Christianity in 1915, his experience in the army, his return home, his efforts to bring education to his isolated home in Tennessee, his agreement to allow a movie to be made of his life, and then, finally, his sad twilight years when the old hero was beset with health and financial problems that plagued him until his death in 1964. Much of this is told in York's own words, as Colonel Mastriano borrows heavily from York's autobiography and diary. What is new and most interesting is the comprehensive treatment given to York's part in the Meuse-Argonne offensive, and in particular, his exploit on 8 October 1918. Using the archeological evidence uncovered, Colonel Mastriano gives the most detailed and complete description of York's action I have ever encountered. In addition to the archeology, the author has done extensive research in German Army archives to help flesh out many new details. New information includes the fact that York had help from the remaining American soldiers in his squad, as fired American rounds were found among the gear dropped by the German prisoners. Indeed, it appears one of the other American survivors helped York repulse the bayonet attack with his Colt .45 pistol. 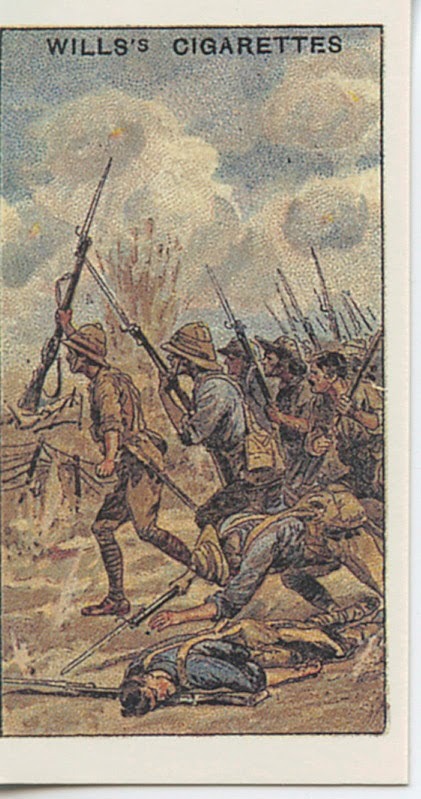 Another new item is a picture, long mislabeled, which the author claims is a photo of York leading his line of prisoners past a group of Doughboys. Colonel Mastriano deftly puts York's action in a larger historical perspective. The Germans York captured were part of a planned German counterattack aimed at driving American units back out of the Argonne Forest. York dislocated that plan. In addition, by clearing out a large portion of the German defenses, he paved the way for the successful capture the next day of the German supply road that had been the original objective of the American attack. With their supply route threatened, the German command gave the order to pull back from this sector of the Argonne Forrest. In the last part of the book, Colonel Mastriano recaps his team's efforts to find the York site, and he describes the methodologies used to validate their location as the correct site of York's battle. The Colonel includes a detailed description of the artifacts recovered by his team, which is particularly fascinating. For example, in York's account of his action, he said he fired all of the rifle ammunition carried in the front part of his ammo belt. This would have been 50 rounds. Col Mastriano found 46 fired rifle cartridges in an area five feet in diameter adjacent to the site of a German machine gun emplacement. A forensic expert identified these cartridges as having come from the type of weapon York used, and all were identified as having been fired from the same rifle. In addition, a grouping of 24 spent .45 caliber cartridges were recovered from an area near an ancient boundary trench. In York's account of the battle he said a group of about a dozen German soldiers emerged from a trench, made a bayonet charge toward him, and York dispatched about half of them with his .45 Colt pistol. Again, a forensic expert has identified that the 24 rounds were fired from two different Colt pistols. One of the surviving American soldiers was armed with a Colt pistol and claimed to have helped York repulse the Germans' attack. Gear from some of the Germans killed in the attack was also found in this area. And, finally, a German I.D. 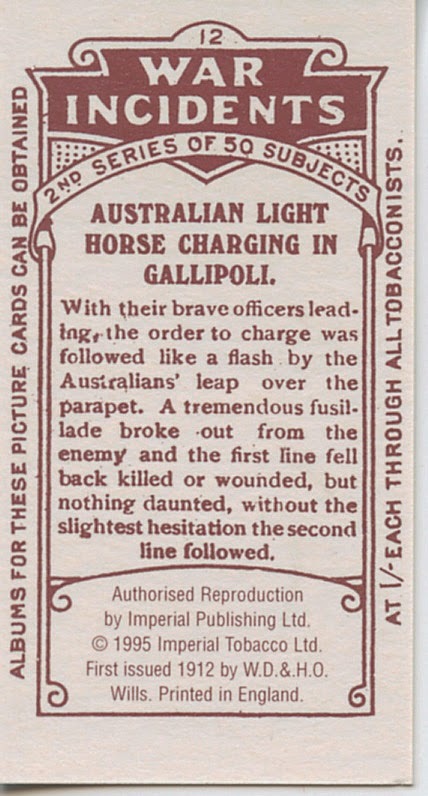 tag of a specific soldier was found, and research proved the soldier was on the rolls of one of the German units that York engaged on 8 October. This German soldier was not part of the prisoners taken by York but was killed in action later that day. For further reading, both teams have websites: www.sergeantyorkproject.com and www.sgtyorkdiscovery.com. Both have videos on YouTube (search for Sgt. York), and both have made their case in the pages of Battle Guide, Issue 10, November 2011, a publication of the Guild of Battlefield Guides. It can be accessed on line at www.gbg-international.com/battleguide.html. 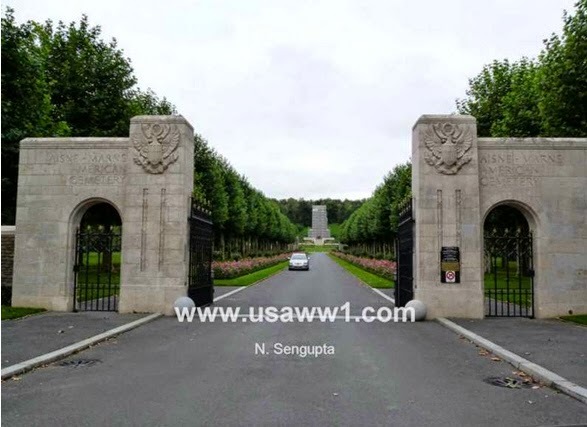 The Sergeant York Project has also published Sergeant York of the Argonne Tour Guide, which includes their argument for their site and which can also be found in their guide to the Meuse-Argonne Battlefield. Want to Break the Trench Deadlock? 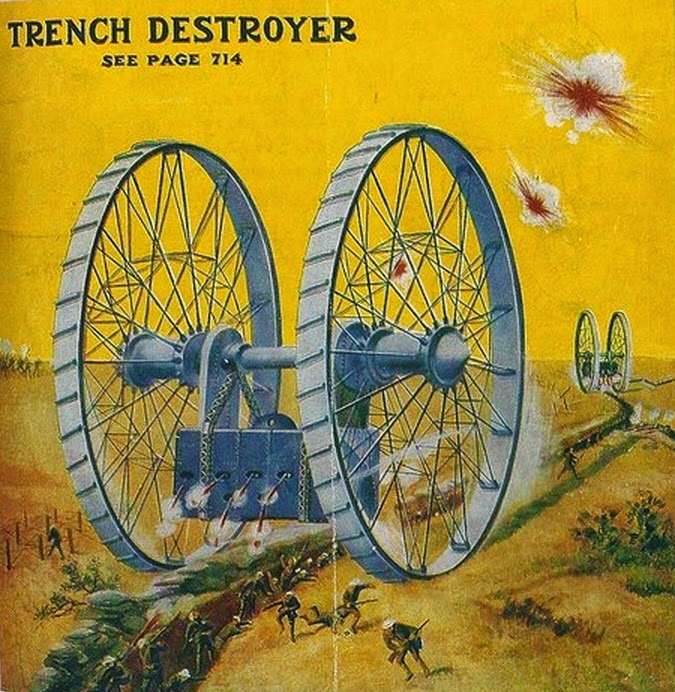 Build the "Trench Destroyer." 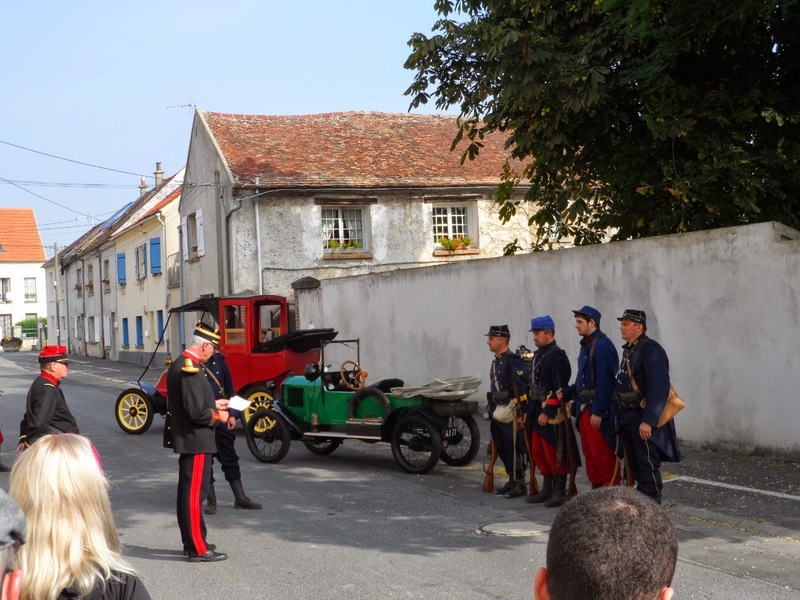 On the 7th of September my recent Great War Centennial tour group spent a day at Villeroy, France, where the Battle of the Marne broke out exactly 100 years and 2 days earlier. 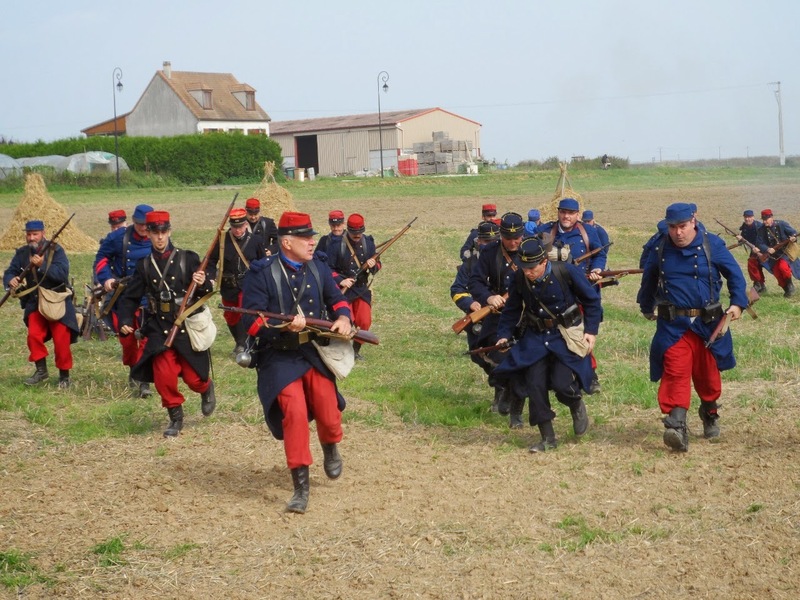 Philippe Braquet and his staff at the local museum organized an reenactment of the battle. 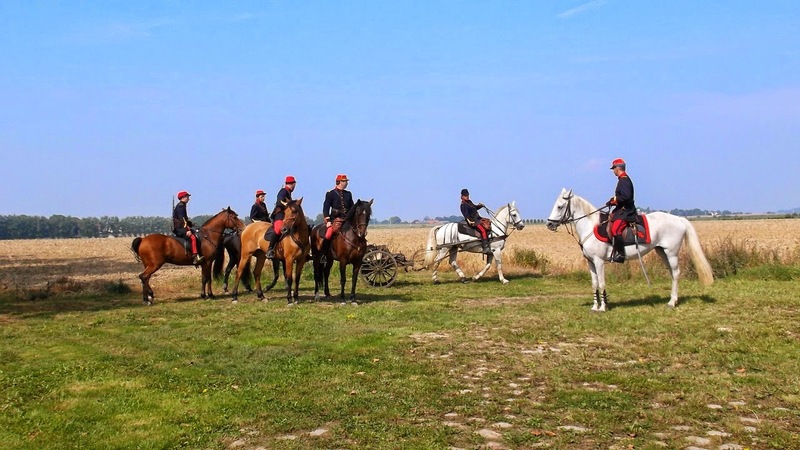 Rather than one big battle, groups were taken on a circuit tour that included an encampment, the experience of mobilization, transport to the battlefield via taxis, an infantry assault, cavalry, and artillery displays. Here are some images from the day's events. 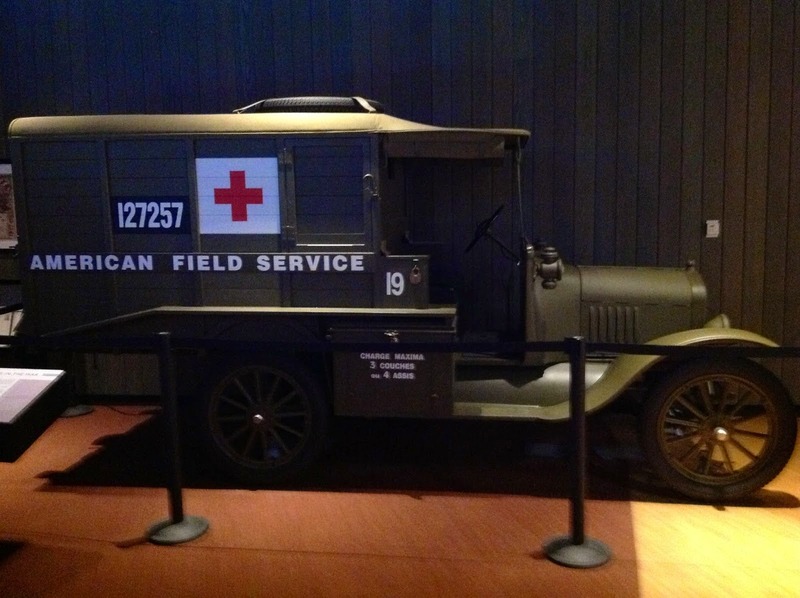 Started in 1914 and funded by private donations, the American Field Service shouldered a mission to man ambulances transporting wounded Allied soldiers back from the front to casualty clearing stations and hospitals. 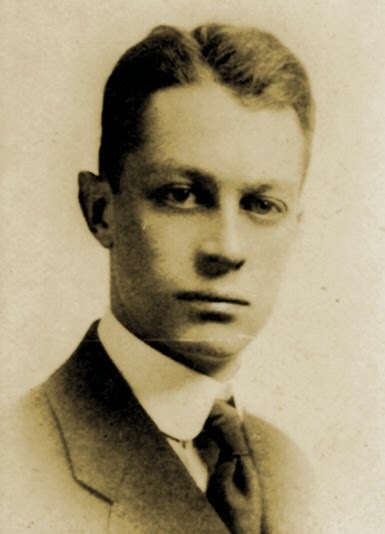 Over 2,200 men served with the AFS, and one of these was Edward I. Tinkham, born 3 August 1893 in Radnor, PA. Schooled at Montclair Academy in New Jersey, he entered Cornell University with the Class of 1916, where he excelled as a member of the varsity track and cross-country teams. He left his studies midway through his senior year to join the AFS. On 26 February 1916 he joined SSU 3 in Lorraine, which was soon moved to Verdun. When SSU 3 was shifted to the Salonika Front, Tinkham was reposted to SSU 4 to stay on at Verdun, and he completed six months of continuous field service. He was awarded the Croix de Guerre by the French 129th Division for bravery in action. "WE are back, far back of the lines, en repos, with the tattered remains of our French division. We have just come back from two weeks at Verdun and our cars are battered and broken beyond a year's ordinary service. It began strong. The first night I was off duty and missed out on one disagreeable experience — a gas attack. One has to breathe through a little bag affair packed with layers of cloth and chemicals! The eyes are also protected with tight-fitting isinglass, which mists over and makes driving difficult. The road was not shelled that night, so things might have been worse. The second night was my go. We rolled all night from the paste de secours back to the first sorting-station. The paste was in a little town with the Germans on three sides of the road and all in full view of them, which made daylight going impossible. The day work was evacuating from sorting-stations to field hospitals. There our work stopped. English and French sections worked from there back to the base hospitals. The road ran out through fields and a little stretch of woods, with French batteries situated on both sides the entire way, which drew the fire. Four trips between dusk and dawn were the most possible. The noise of French fire was terrifying until we learned to distinguish it from the German arrivees. It is important to know the difference, and one soon learns. The depart is a sharp bark and then the whistle diminishing. The arrivees come in with a slower, increasing whistle and ripping crash. In noise alone it is more than disagreeable. The poste de secours was an abri in a cellar. Of the town there was scarcely a wall standing — marmites had done their work well. The road was an open space between, scalloped and scooped like the moon in miniature. We would drive up, crawling in and out of these holes, turn around, get our load, and go. When the place was shelled, we had time to hear the bus coming and dive under our cars. The drive back was harrowing. One was sure to go a little too fast on a stretch of road that felt smooth and then pitch into a hole, all but breaking every spring on the body. I'll never forget the screams of the wounded as they got rocked about inside. At times a stretcher would break and we would have to go on as it was. Of course we had to drive in utter darkness, with passing convoys of artillery at a full gallop going in opposite directions on either side. Each night a bit more of tool box or mud-guard would be taken off. Often I found myself in a wedge where I had to back and go forward until a little hole was found to skip through, and then make a dash for it and take a chance. One night there was a thunderstorm with vivid lightning and pitch darkness. The flashes of guns and of lightning were as one, and the noise terrific. That night, too, the road was crowded with ammunition wagons. But worst of all, it was under shellfire in three places so that traffic became demoralized because of the dead horses and wrecked wagons smashed up by shrapnel. All our cars were held up in parts of this road. There is no feeling of more utter helplessness than being jammed in between cannon and caissons in a road under shell-fire. In order to get through, two of the men had to run ahead and cut loose dead horses; but no one was hit that night. The next night was the climax of danger, as things eased off a bit after; but the strain was telling and our driving was not so skillful. For instance, next to the last night I collided with a huge ravitaillement wagon coming at full gallop on the wrong side of the road, with the result that the entire front of my car went into bow knots. But I landed clear in safety. This occurred under the lee of a cliff, so we went in search with a wrecking-car the next day. After twenty hours my car was running again, shaky on her wheels, but strong in engine. She goes to Paris soon for shop repairs. Poor old Alice! A wrecked car in so short a time! Patched with string and wire and straps, she looks battle-scarred to a degree. Her real battle souvenirs are five shrapnel balls embedded in the roof and sides. I don't believe in collecting souvenirs, but these I could not help preserving! I am mighty glad we are through and out of it all. Whatever action we go into again, it cannot be harder or more dangerous than what we have been through. That will be impossible. I don't yet know whether I am glad or not to have had such an experience. It was all so gigantic and terrifying. It was war in its worst butchery. We all of us lost weight, but health and morale are O.K., and we are ready for more work after a rest." 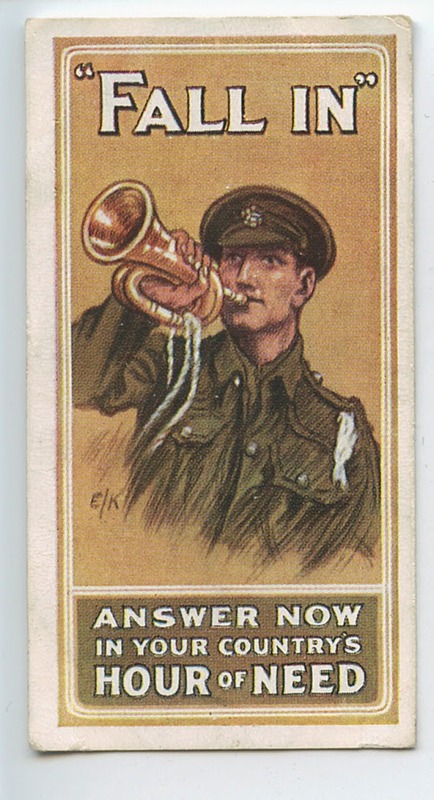 More to come on Edward Tinkham's war service on Roads to the Great War. After visiting Château-Thierry, we went to Belleau. Getting there was easy. Head back out of Chateau-Thierry on D1003 to go back to the Hill 204 American Monument. Just across from the entrance to the monument is the junction of D1003 and D9. D9 leads straight to Belleau, four miles away. First stop was the little Hotel de la Mairie (City Hall), which is also the museum that commemorates the Battle of Belleau Wood. The battle was fought by French, British and American troops against the Germans from June 1 to June 26, 1918. The Americans suffered 1,811 KIA and 8,000 other casualties. German figures are inexact, but they were frequently losing numbers similar to their opponents. By the time the battle ended, the maniacal US Marine defense had earned them the sobriquet Teufelhunden (meaning Devil Dogs). The museum is tiny, but still worth visiting with its small collection of uniforms, weapons, shaving kits, mess kits, medals, grenades, gas masks, prayer books and other memorabilia. It also had an “original” (nicely restored) red and black Renault taxi (of WWI’s First Battle of the Marne legend) on display. The distance from the Hotel de la Mairie and the Belleau Wood cemetery (officially the Aisne-Marne Cemetery)/battlefield is just 300 yards. Between the two is a church. Apparently the American officer in charge knew that when he gave the order to attack the Germans that the church would get destroyed. He vowed he would rebuild it after the war. The story is that he did, thanks to a day's pay very touchingly volunteered by all the American soldiers. Next we went to the cemetery and walked around. The 49-acre cemetery sits at the base of a plateau. The battlefield is a small one-mile patch of forest atop that plateau. The cemetery is laid out in the shape of a crescent with two wings and a giant thousand foot long promenade in between. The promenade leads back to the street on one hand and up to a tall Romanesque tower on the other. Behind that is the plateau. The crescent is actually about 12 rows of crosses interspersed with an occasional Star of David. Each row seems to number in the hundreds. 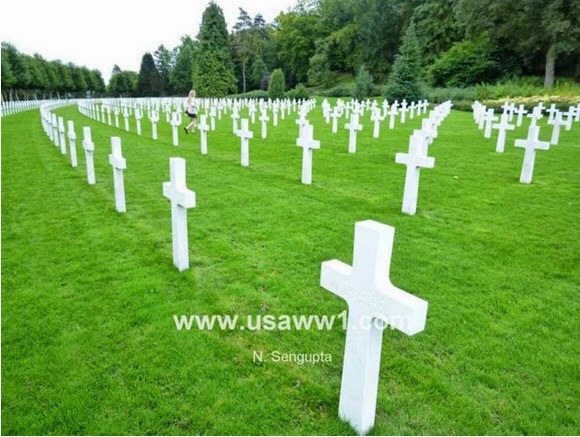 In total, there are 2,289 dead American World War I soldiers buried here. They represent all 48 American states of that time; 251 are unknown. The Romanesque tower is actually the memorial chapel. 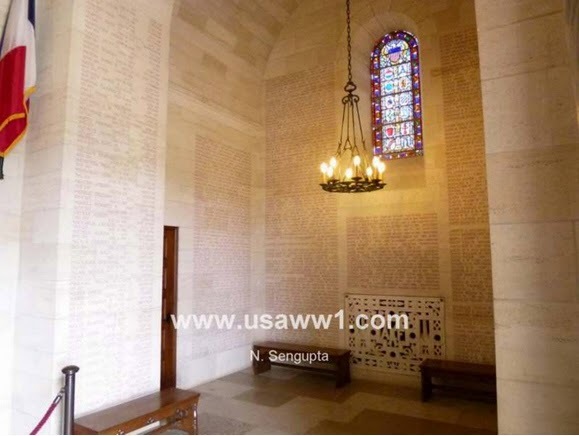 Inside the limestone masonry is engraved the names of another 1,060 missing dead. Not all are soldiers, as there are the names of airmen too. There are two big American flags atop giant flagpoles at the Belleau Wood Cemetery. We helped lower the flags as the place closed, and then we made a two-minute drive up to the small plateau that is above/behind the cemetery. 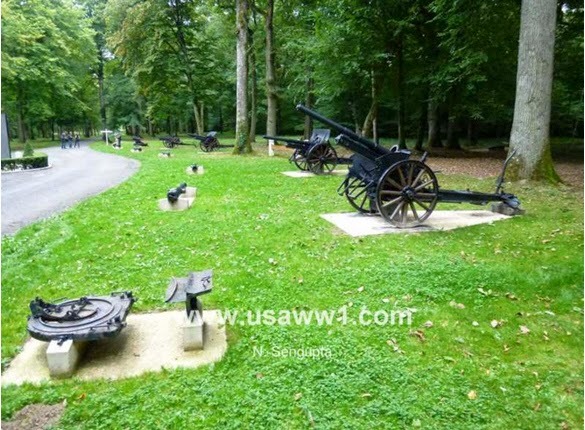 That is the actual Belleau Wood battlefield. The plateau has many things to see. But we are short on time and only had time to see the little artillery park of captured German artillery and unexploded shells by the parking lot. If the trees weren’t there, then we would be able to overlook the cemetery. After the battle, with the trees gone, that would have been the case. We saw little other than the little artillery park. But there is more. From previous trips I still remember the scared landscape: craters, trenches and the ruins of a small octagonal dovecote (dove tower), once used for raising doves. They are all still there, but now they’ve been filled in a bit by the passage of time, dirt, moss and mushrooms and obscured by shadows of regrown trees. Walking on the little battlefield, with its lush tree canopy, thick woods and utter silence makes it a great place for introspection and contemplation. But the same isolation permits one to vividly imagine the sounds and smells of battle that went on in 1918. 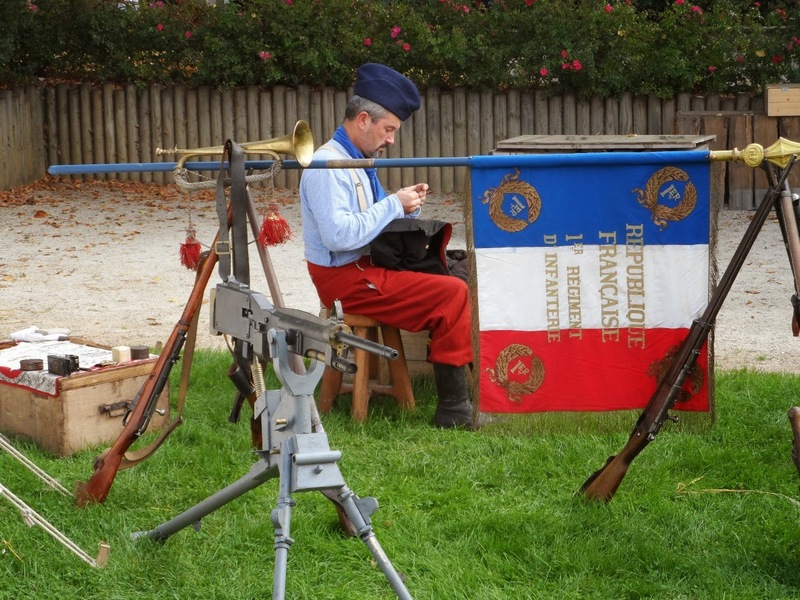 It’s hard to believe that so many men were wounded or killed in the little forest, which the grateful nation of France has since renamed Bois de la Brigade de Marine (The Marine Brigade Woods). Soon we were on our way back home. What a great day trip! 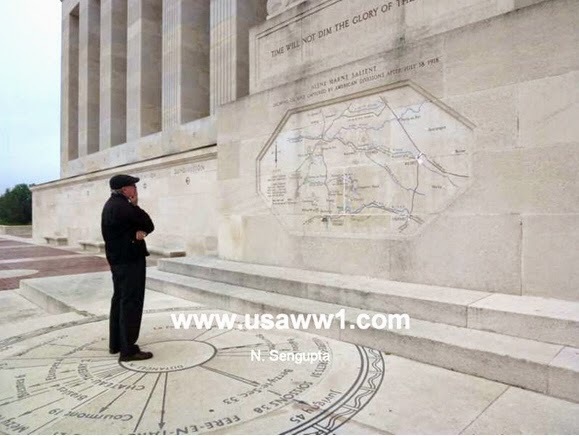 If you have questions about trip planning to explore the World War I battlefields of France, then email me at info@usaww1.com. Bon voyage, Narayan Sengupta. Narayan Sengupta is the author of books such as “American Eagles”, “Lafayette Escadrille”, “POW Stories” and “Disaster at Dieppe”. To order them or to read more of his writing, see http://www.usaww1.com/History-of-the-United-States-Air-Service.php4 . 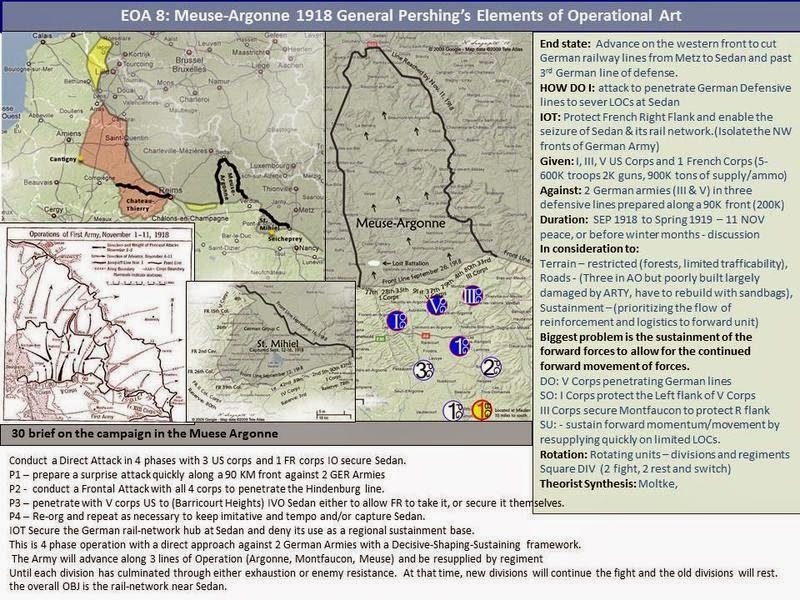 Tomorrow is the anniversary of the start of the Meuse-Argonne Offensive in 1918. Summarized here is that 47-day struggle that helped end the Great War. From numerous indications and reports it is apparent that an enemy attack, mainly American, is imminent against the south front of Composite Army C; lately such an attack also appears to be shaping against its west front. Such an operation seems highly probable in view of the general situation. . .it is obvious that the enemy will attempt to find a vulnerable point, not only of our front but of our country, which can be reached more easily and quickly. Such an opportunity would be offered by invading LORRAINE. The enemy would be on coveted soil which he wants to liberate, he would threaten one of our most important lines of communication, as well as the SAAR coal and industrial region. Moreover a sally from the region of VERDUN offers the prospect of paralyzing our utilization of the BRIEY Basin and would likewise endanger one of our most important lines of communication. The two operations combined, enveloping METZ, would drive a wedge into our country which would not only be effective, but which also would seriously influence the conduct of the fighting on the northwest front, in a manner that would prove to be less expensive to the enemy than an attack on that front. Therefore I consider it a probability to be deduced from the general situation that the large-scale battles on the west will soon be followed by events of equal, perhaps decisive, importance on the fields of LORRAINE. Now, it may be objected that the gates of invasion have been open to the enemy for a long time, without his using them. But here-to-fore the enemy had no forces available for this purpose. Now he can afford such a large- scale assault--without inadmissibility stripping the English-French front--[by using fresh American troops]. The enemy is continuing his attack on Meuse Group-West but, until now, he has not gamed any successes worth mentioning, [however] 2. It is again urgently emphasized that it is vitally important to the entire Western Front that the positions of the Fifth Army be held. It would seem that our troops are not well organized for an attack. The gaining of the objectives for the present, does not seem possible without undue losses unless time is taken to reorganize and prepare for a concentrated, simultaneous attack. In the V Corps sector alone, the 2nd Division had 236 divisional guns, the 89th Division had 208 guns, and they shared 152 corps guns, that were put under corps direction. This was spread on an eight-kilometer front, giving the corps an artillery density of one 75mm gun for every 29 meters, a 155mm or 8-inch howitzer for every 39 meters and a 105mm or 155mm gun for every 69 meters of front. The division also had a battery (12) of 6-inch Newton mortars and a number of gas projectors. "So I must really say that the British food blockade and the American blow in the Argonne decided the war for the Allies." [and that] "... without the American troops and despite a food blockade... the war could have ended in a sort of stalemate." Kaiser Wilhelm II and his wife, the Empress Augusta Viktoria, had six sons and one daughter. 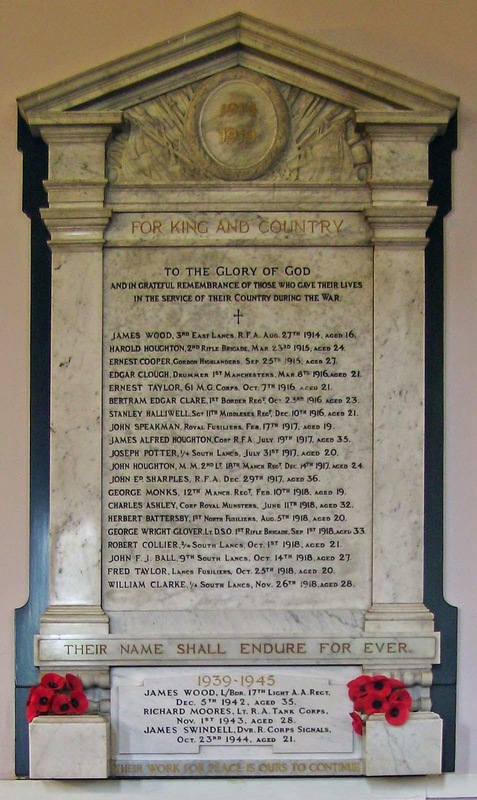 Five of their six sons were serving frontline officers in the Great War. This abundance of sons in uniform seems a fair representation of the military culture of Germany at the time and indeed of the Kaiser’s personal inclination. Given how many spare heirs he had on hand, any threat to the succession probably seemed minimal, so risking their lives in military glory could be worthwhile. Ironically, all six survived the war. 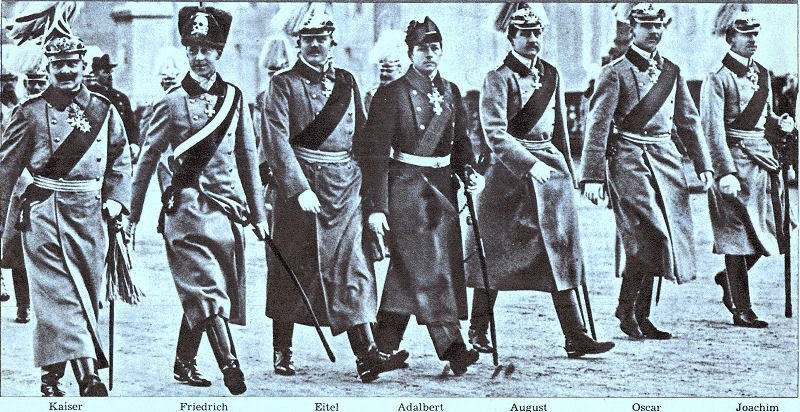 Five stayed in Germany, although the Crown Prince was briefly exiled from 1918 to 1923, and Prince Adalbert decamped to Switzerland. These are but royal heirs. European nobility suffered considerable losses of multiple sons and heirs. But the most sons and heirs lost were the countless, mostly now nameless men in the millions on all fronts. Although this book is primarily for readers interested in the literature of the Great War, it will appeal to anyone who wishes to gain an insight into the effect the war had on language, writers, and readers. In some ways, Stevenson's book is a 21st-century extension of Paul Fussell's landmark The Great War and Modern Memory and also of Samuel Hynes's A War Imagined. However, Literature and the Great War provides us with a quite fresh and original look at how the war was put into words. Stevenson's central point — as has also been said of the Holocaust —is that the Great War is impossible to portray accurately in language and literature because the war and its bloodletting nightmare are ultimately unspeakable, unimaginable, and unrepresentable. He illustrates his thesis by citing British, American, French, and German authors plus letters, memos, military dispatches, and newspapers that both soldiers and civilians were exposed to at the time and in the decades following the war. This book isn't an "easy read", but it's well worth the effort it requires. You may not agree with all that Stevenson claims (just as many found fault with Fussell), but his points should be carefully considered. The text includes 12 interesting photographs I hadn't seen before and the bibliography and index are solid. The book's four chapters are entitled "Unspeakable War", "Unaccountable War", "Unfamiliar Lines", and "Unforgettable War". Let me summarize the main ideas you will encounter in each chapter. "Unspeakable War", the first chapter, discusses how the war caused people to lose faith not only in previous assumptions of progress and civilization but also in the capability and reliability of language. As Stevenson points out, "For soldiers on all sides, bombardment, sudden death, mutilation, men blown to pieces…seemed beyond anything that could be represented in conventional language or charted through established narrative form" (p. 11). Not only soldiers found the war indescribable, however. Civilians — authors, journalists, letter-writers, propagandists — all found themselves challenged by the new reality and by the constraints of language that were narrowed even further by censorship, military jargon, and unfettered patriotism. As a result, accurate description and reporting were often replaced by jingoism and a shallow prose that could never fully reflect the true experience of the war. When writing about the French Army's experience at Verdun, Jules Romains states that "there was no lack of eyewitnesses, but none of them could get far enough away from the drama to see it as a whole" (p. 63). This necessarily limited vision of events throughout the war and of the war itself is the topic of Chapter 2, "Unaccountable War". The scale and complexity of the catastrophe was far beyond the observation of any one individual. Thus, supposedly valid accounts of minor actions, large battles, and campaigns, and the history of the war itself, are pieced together from varying and subjective individual accounts and experiences. These are the building blocks used to construct narratives, memoirs, novels, and even official accounts of the war. The part such limitations play in the work of noted writers and novelists is carefully considered in this chapter. In Chapter 3, "Unfamiliar Lines", Stevenson looks at war poetry, particularly at the work of the group who eventually became known as the War Poets. Although the overwhelming nature of the war might well have been considered a subject unfit for poetic expression, especially for a generation raised on the Romantics, poetic production and demand increased with the outbreak of war. Even in August 1914 the Times was being flooded with about a hundred war poems a day, as were other journals and newspapers (at this point mostly written by civilians). Poetry, it seemed, was the best literary genre to deal with the overwhelming nature of the war, at least on the personal level. This turned out to be true for soldier and civilian alike, but for the combatant in particular the poem appealed due to its shortness and lack of bulky manuscript. As Stevenson puts it, "For soldiers necessarily traveling light, and lacking confident expectancy of long life, poetry's brevity offered obvious attractions" (p. 128). This chapter provides copious quotes from familiar and little-known poets that "demonstrate the effectiveness…of the lyric form — war poets exploiting its capacity to focus intense feelings within split instances, or brief, particular moments of vision" (p. 130). Stevenson also analyses how war poets were adept at incorporating traditional poetic motifs such as pastoralism, sky, stars, the earth, nature, life, and death, into their matter. This poetry was to set itself on a new course from romanticism to a terrible new reality, and thus from idealism to disillusion. In his fourth and final chapter, "Unforgettable War", Stevenson (like Fussell before him) argues that the Great War still exerts considerable influence on our modern world. This is particularly true in acts of remembrance, memorial, and commemoration, but also in literature. Writers from the late 1920s on inevitably saw the conflict through the lens of time, personal experience, and numerous reinterpretations. H.M.Tomlinson claimed in All Our Yesterdays that "the Great War was almost as many different wars as there were men who were in it" (p. 197). The Second World War interestingly reshaped some of the views of the First, not always favorably. One noted historian claimed that "viewed through the lens of the "Good War' of 1939-45 the struggle of 1914-1918 seemed to be a very bad war indeed" (p. 193). And although modernism and other literary schools have moved on to different priorities, they can often be found to have tendrils that reach back to the Great War and its literature. Those interested in this literature will find much in Stevenson's book to ponder, digest, agree with, and, perhaps, disagree with. The literature itself will remain. What changes with time are tastes, attitudes, backgrounds, criticism, literary movements, and culture itself, all of which constantly bring about ever-varying appreciation, interpretation, and reinterpretation of the literature of those who knew the Great War. 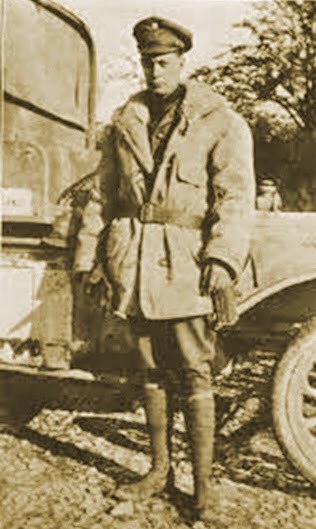 American war correspondent E. Alexander Powell visited the battlefield in Champagne toward the end of the September 1915 battle. Here is a vivid description of what he saw. The thing of which the Champagne battlefield most reminded me was a garbage-heap. It looked and smelled as though all the garbage cans in Europe and America had been emptied upon it. This region, as I have remarked before, is of a chalk formation, and wherever a trench had been dug, or a shell had burst, or a mine had been exploded, it left on the face of the earth a livid scar. The destruction wrought by the French artillery fire is almost beyond imagining. Over an area as long as from Charing Cross to Hampstead Heath and as wide as from the Bank to the Marble Arch the earth is pitted with the craters caused by bursting shells as is pitted the face of a man who has had the small-pox. Any of these shell-holes was large enough to hold a barrel; many of them would have held a horse; I saw one, caused by the explosion of a mine, which we estimated to be seventy feet deep and twice that in diameter. 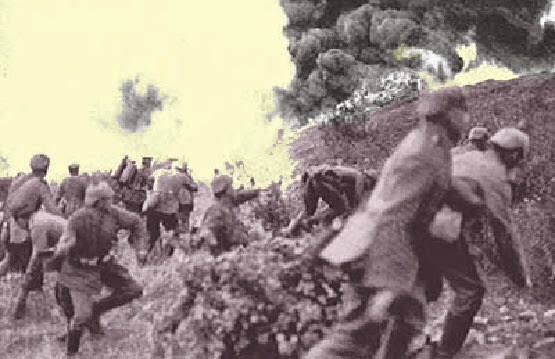 In the terrific blast that caused it five hundred German soldiers perished. At another point on what had been the German first line I saw a yawning hole as large as the cellar of a good-sized apartment house. 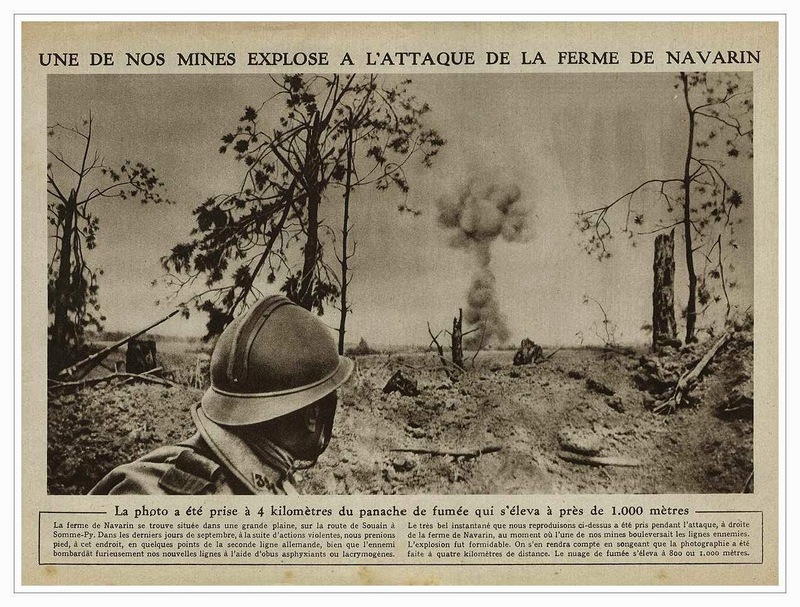 It marked the site of a German blockhouse, but the blockhouse and the men who composed its garrison had been blown out of existence by a torrent of 370-millimeter high-explosive shells. 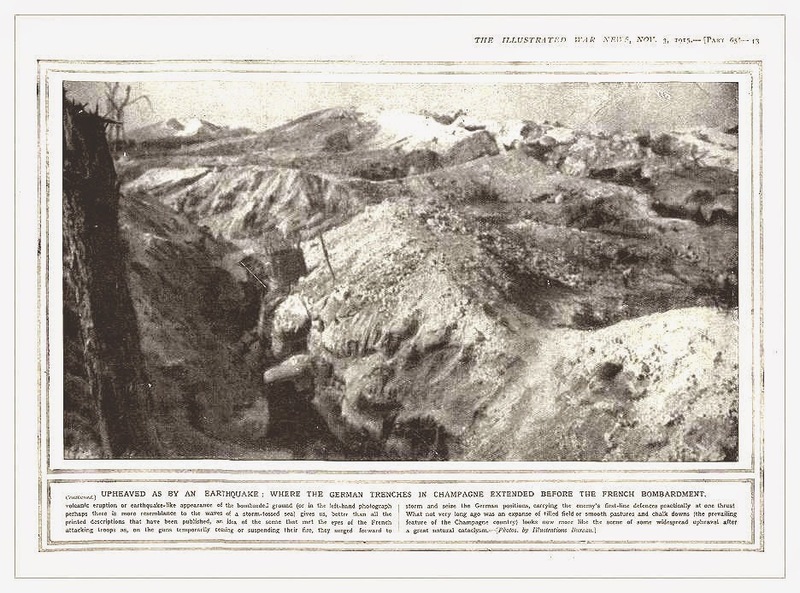 The captured German trenches presented the most horrible sight that I have ever seen or ever expect to see. This is not rhetoric; this is fact. Along the whole front of fifteen miles the earth was littered with torn steel shields and twisted wire, with broken waggons, bits of harness, cartridge-pouches, dented helmets, belts, bayonets-some of them bent double-broken rifles, field-gun shells and rifle cartridges, hand-grenades, aerial torpedoes, knapsacks, bottles, splintered planks, sheets of corrugated iron which had been turned into sieves by bursting shrapnel, trench mortars, blood-soaked bandages, fatigue-caps, entrenching tools, stoves, iron rails, furniture, pots of jam and marmalade, note-books, water-bottles mattresses, blankets, shreds of clothing, and, most horrible of all, portions of what had once been human bodies. Passing through an abandoned German trench, I stumbled over a mass of grey rags, and they dropped apart to disclose a headless, armless, legless torso already partially devoured by insects. I kicked a hobnailed German boot out of my path and from it fell a rotting foot. A hand with awful, outspread fingers thrust itself from the earth as though appealing to the passer-by to give decent burial to its dead owner. I peered inquisitively into a dug- out only to be driven back by an overpowering stench. A French soldier, more hardened to the business than I, went in with a candle, and found the shell-blackened bodies of three Germans. Clasped in the dead fingers of one of them was a postcard dated from a little town in Bavaria. It began : "My dearest Heinrich: You went away from us just a year ago to-day. I miss you terribly, as do the children, and we all pray hourly for your safe return —." The rest we could not decipher; it had been blotted out by a horrid crimson stain. Without the war that man might have been returning, after a day's work in field or factory, to a neat Bavarian cottage, with geraniums growing in the garden, and a wife and children waiting for him at the gate. Though when I visited the battlefield of Champagne the guns were still roaring —for the Germans were attempting to retake their lost trenches in a desperate series of counter-attacks — the field was already dotted with thousands upon thousands of little wooden crosses planted upon new-made mounds. Above many of the graves there had been no time to erect crosses or headboards, so into the soft soil was thrust, neck downward, a bottle, and in the bottle was a slip of paper giving the name and the regiment of the soldier who lay beneath. In one place the graves had been dug so as to form a vast rectangle, and a priest, his cassock tucked up so that it showed his military boots and trousers, was at work with saw and hammer building in the center of that field of graves a little shrine. Six feet away was another cross which marks the spot where sleeps Gottlieb Zimmerman, of the Wurtemberg Pioneers, and underneath, in German script, that line from the Bible which reads : "He fought the good fight." Over a decade ago, commentator Paul Berman shared this view on the Great War's influence. It becomes ever more obvious that the First World War was the great trauma of modern civilization. Something huge cracked in the First World War and has never been repaired. Out of the First World War came a series of rebellions against liberal civilization. These rebellions were accusations that liberal civilization was not just hypocritical or flawed, but was in fact the single great source of evil or suffering in the world. . .Behind all the movements that made these proposals was a pathological fascination with mass death. Mass death was itself the principal fact of the First World War, in which 9 or 10 million people were killed on an industrial basis. And each of the new movements proceeded to reproduce that event in the name of their utopian opposition to the complexities and uncertainties of liberal civilization. The names of these movements varied and the traits that they displayed varied — one was called Bolshevism, and another was called Fascism, another was called Nazism . . . My argument is that Islamism and a certain kind of pan-Arabism in the Arab and Muslim worlds are really further branches of the same impulse. This great compilation of regular contributor Cyril Mazansky's work is to be published in the spring by Schiffer Publishing of Pennsylvania. 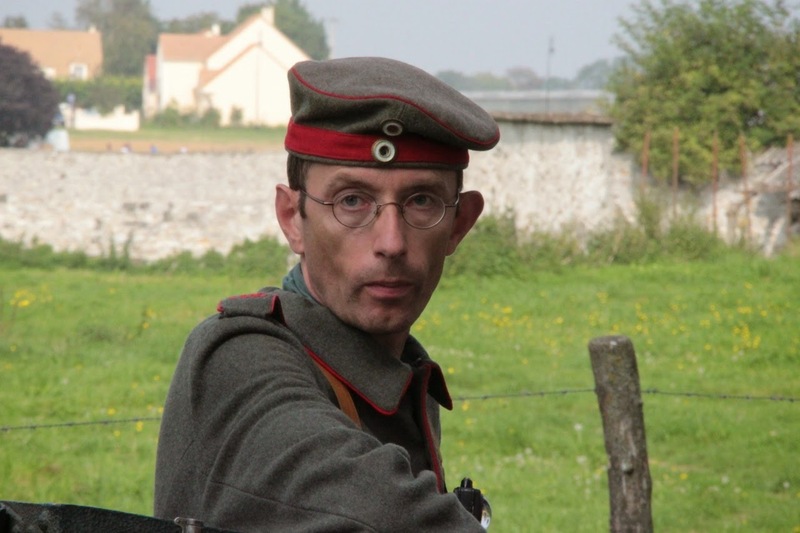 His work approaches the history of the war from a unique perspective. 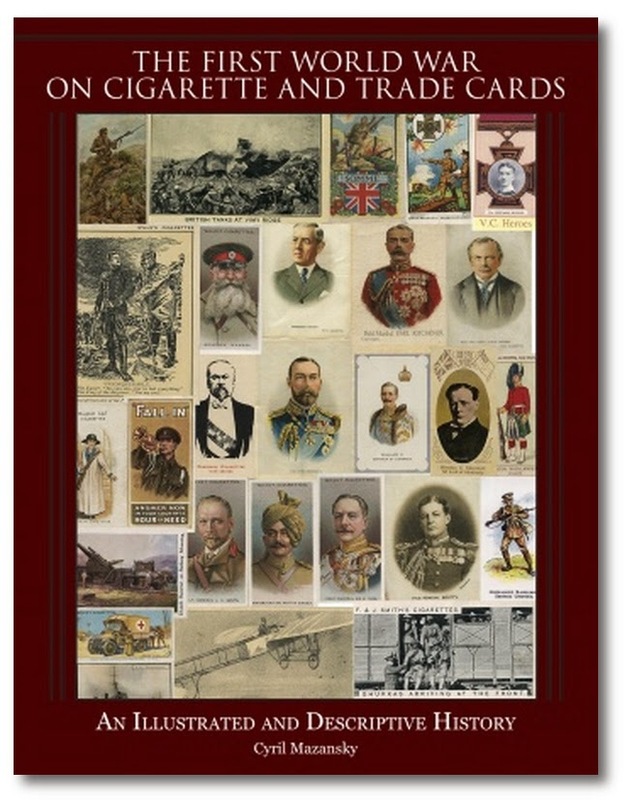 Utilizing remarkably detailed issues of cigarette and trade card sets related to the First World War, the author provides a richly illustrated and descriptive tapestry of this great conflict. Not only are the usual political and armed services aspects of the war covered in detail, but also other components of the military such as armaments, awards, uniforms, and militaria and the important role that propaganda played. The social and literary aspects of the war form an important part of the book as well. All these written details, a significant amount of which is drawn from the descriptions on the cards, complement the hundreds of card illustrations found throughout the work. Here are some examples from his collection we have not presented previously. 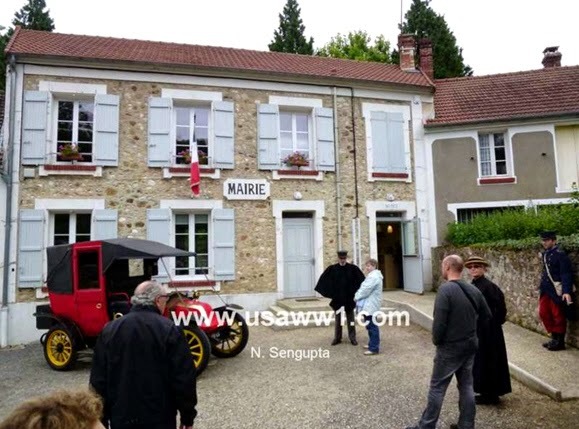 In September 2013, we visited the American WWI sites of Château-Thierry and Belleau Wood. Both are about 60 miles east by northeast of Paris and seven miles apart from one another. Getting there by car is remarkably easy. Take the AutoRoute A4 east out of Paris to exit 20. Go south on departmental route D1, the Avenue de Soissons. It takes you three miles into Château -Thierry to the Marne river. Just before the river, turn right onto D1003, Avenue de Paris. From there it is two miles to the entrance of the American Monument at Château -Thierry, which sits on Hill 204, one of Château-Thierry's western flanking hills. The monument is perhaps 150 feet long by 40 feet high, making it the largest U.S. World War I monument that I know of. 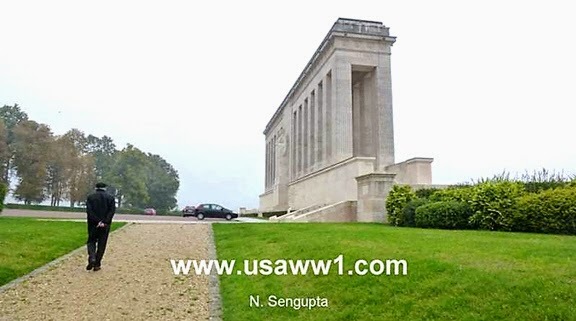 It is a somber Art Deco mass of beige stone that commemorates the U.S. 2nd Division and 3rd Division’s spirited defense of Château-Thierry against the Germans during the Second Battle of the Marne, fought 15 July to 18 July 1918. The Germans, freshly reinforced by crack divisions pulled from the Eastern Front after the fall of Imperial Russia, were hoping to make a final push toward Paris to finally force an end to the endless bloody war. The Allies, reinforced by fresh but untried Americans, were anxious. The Germans had already advanced quite a bit during the spring. And now the French were practically backed against a wall. Again. The Allies fought ferociously. First they learned that the Germans were going to attack on the 15th. Second, the Allied Commander in Chief Marshal Ferdinand Foch ordered a 2:00 a.m. preemptive artillery attack catching many Germans out in the open awaiting their own attack and demoralizing them in the process. Even then, the Germans advanced for a while. But Allied resistance stiffened, and soon the Germans were stopped. 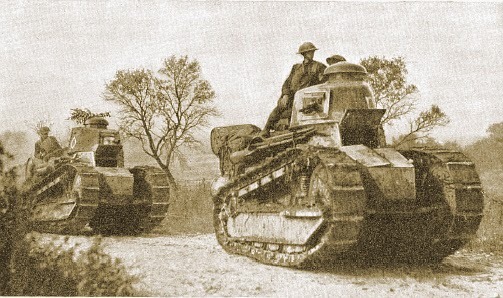 Then came the Allied counterattack supported by over 300 little Renault FT-17 tanks, each armed with either a 37mm cannon or a machine gun giving the Allies real mobile firepower. All this proved a winning combination. 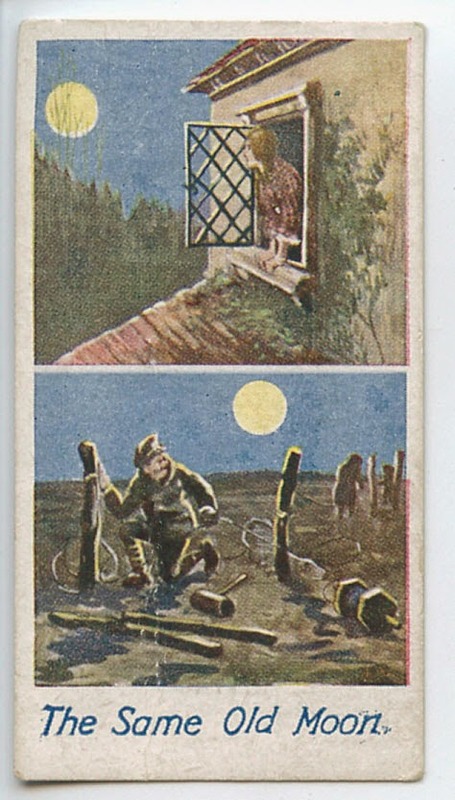 The German offensive had been dented and then repealed. Victory to the Allies. And it was an important one. It was the turning point of the war. For the Germans, it had been their last offensive. Now the Allies would go on the offensive and advance until November 11, 1918. By August 5, they would advance 25 miles from Château-Thierry, one of the best advances since 1914. Even then the French lost 95,000 men in the advance in this sector, the British over 16,000, the Italians about 9,000, and the Americans 12,000. The Germans losses were similar: 139,000. 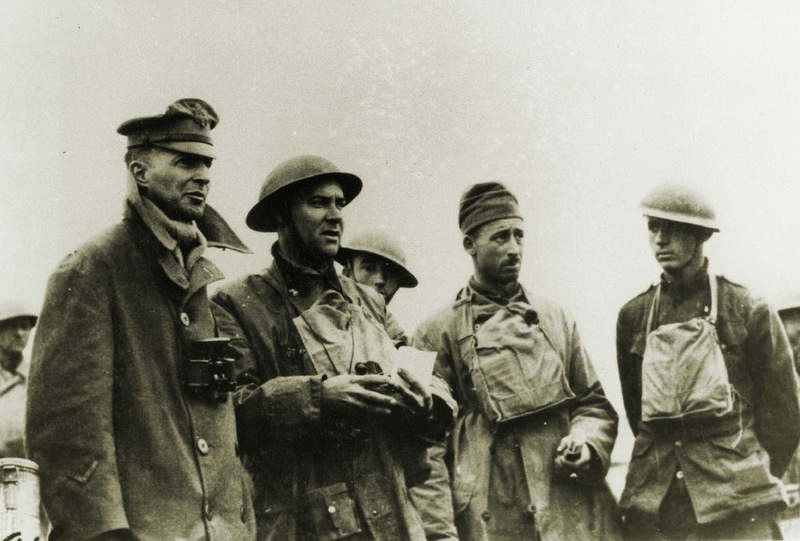 Thanks to their tough resistance in Château-Thierry, the US 3rd Division picked up the nickname “Rock of the Marne,” a name they use to this day. The American monument provides a wonderful view east of the city of Château-Thierry and a great vantage point to imagine the battle and its results. On the reverse side of Hill 204 is the town of Vaux. American and German artillery literally pulverized Vaux while they were fighting over it. It is worth a nice leisurely stroll around the monument’s large manicured grounds. The grass is eternally green, an evolutionary fluke that permits it to survive during the harsh French winter months. Meanwhile, I’m envious that my own grass stateside goes dormant. The monument is a double-colonnade design. At the center on one side are two massive feminine stone figures symbolizing America and France and their very long friendship. On the other is a giant American eagle sitting behind a stylized shield. Inscriptions around the top of the monument list sites of battles: Vaux, Fismes, Belleau Wood, Juvigny, Mezy, Fismette, Berzy-le-Sec, Trugny, La Croix Rouge Farm, etc. In late May 1918 the German army made a surprise attack along the Aisne River and advanced rapidly toward the Marne. Allied reinforcements were hurriedly brought up, including the 2nd and 3rd American divisions which went into position directly across the German line of advance toward Paris. After severe fighting these divisions definitely stopped the progress of the attack on their front and the lines stabilized, the German forces having driven a deep salient roughly defined by Reims, Château-Thierry and Soissons, into Allied territory. The last German offensive on the war, on July 15, included an attack in the eastern part of this salient and there the 3d American division and elements of the 28th were important factors in the successful defense of the allied positions. On July 18 the Allied troops began a general counteroffensive against the whole salient in which the 1st, 2d, 3d, 4th, 26th, 28th, 32d and 42d American divisions, most of which served under the I and III corps, took a brilliant part. This offensive was a complete success, and by August 6 the enemy had been driven beyond the Vesle River. Later the 4th, 28th, 32d and 77th American divisions and elements of the 3d and 93d played a prominent role in the desperate fighting on the north of the Vesle. Of the 310,000 American soldiers who fought in these 0perations, 67,000 were casualties. Later we descend by car into Château-Thierry via the Avenue de Paris. The Avenue de Paris becomes the Avenue Jules Lefebvre, Château-Thierry's main road. It runs by the Marne. 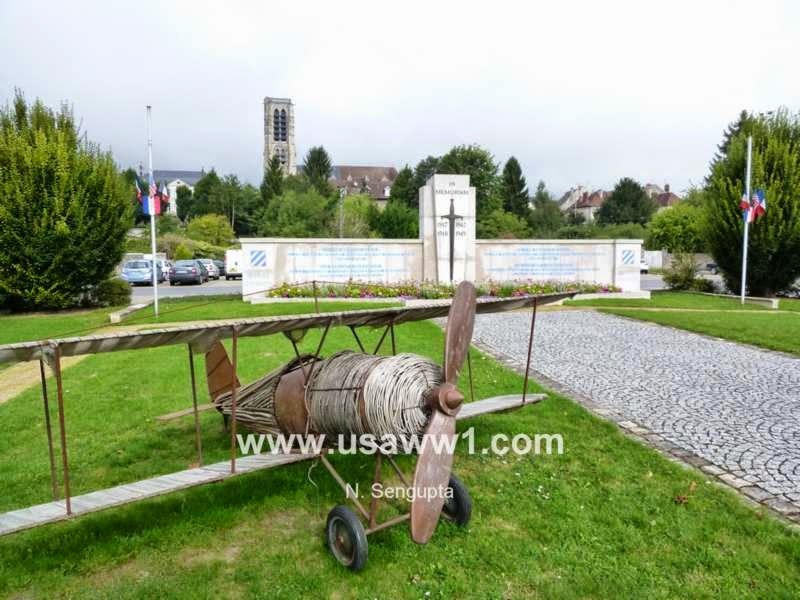 On it in the center of town is a monument to the U.S. 3rd Division — Rock of the Marne — which has a 1:2 scale wicker biplane in front of it. I was really curious about why it was there. 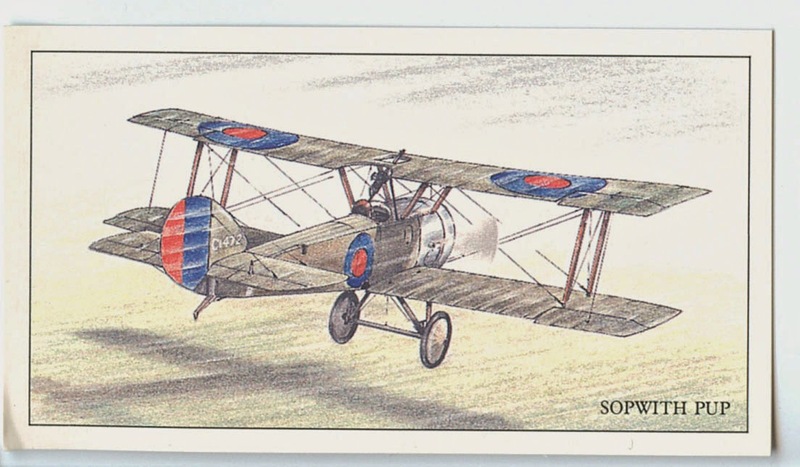 The tail evoked a Nieuport 28. And sure enough, I was later told this was in homage to killed American flier (and son of the ex-president) Quentin Roosevelt. 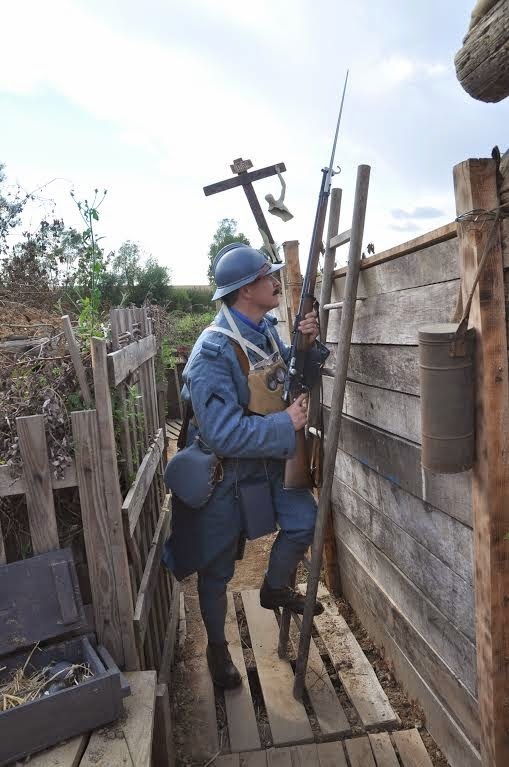 The 3rd Infantry fought twice in Château-Thierry: once in World War I and again in World War II. The original monument was destroyed in WWII, so what you see is the new one. 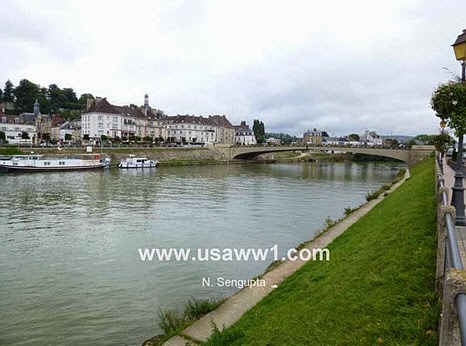 Other units, like the U.S. 4th Division also fought in France twice. The 4th, for instance, led the D-Day invasion at Utah Beach on 6 June 1944. Today Château-Thierry is a bucolic, sleepy, and pretty town of 15,000 people tucked into a gentle bend of the Marne river. It was devastated in 1918. Practically not a single home was left intact. Roofs and walls and windows were all wrecked. But now, on the town's main square are a beautiful little American church, a cinema, and the repaired Hotel de Ville (City Hall). 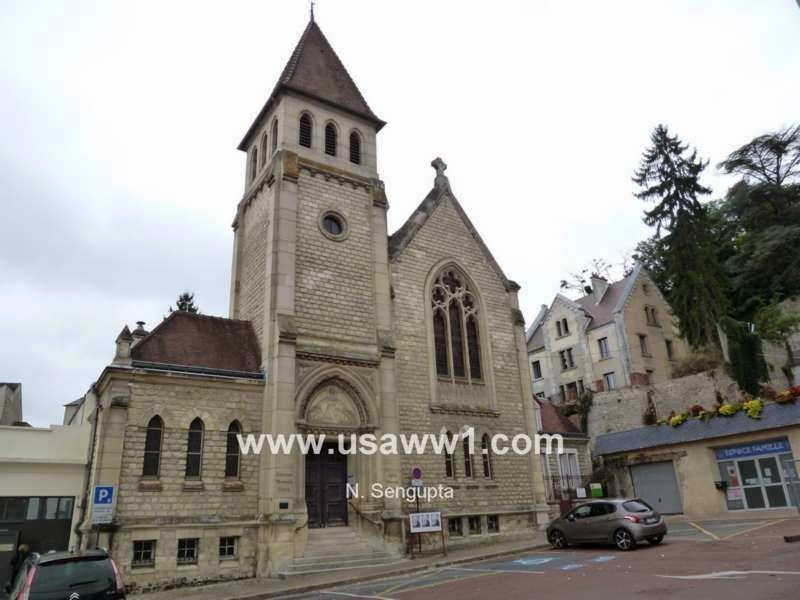 The church was built in 1922 as the American Memorial Church of Château-Thierry. 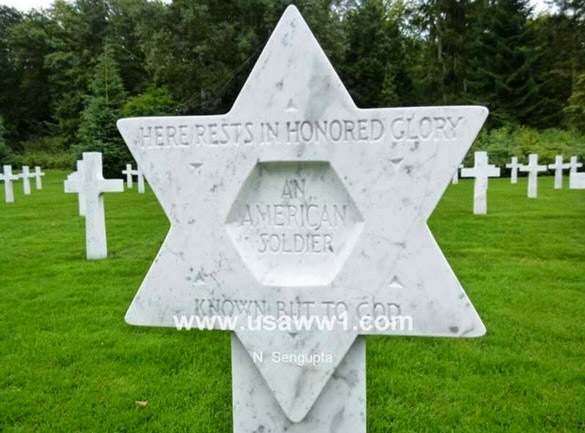 Americans who lost family members in the war made donations to have it built in their memory. Even in the overcast light, a splendid stained glass window facing the square catches my eye. 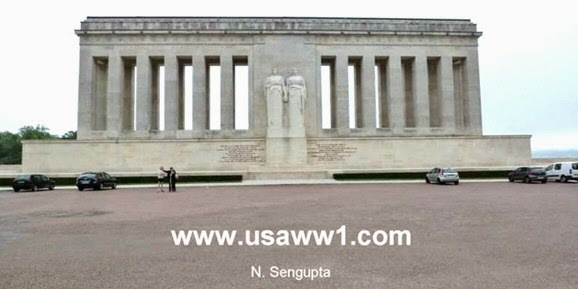 I see American and French flags and historical figures — Washington, Lafayette, Pershing, and various American and French soldiers symbolizing the arc of friendship spanning the American Revolution to World War I.
Narayan Sengupta is the author of books such as American Eagles, Lafayette Escadrille, POW Stories, and Disaster at Dieppe. To order them or to read more of his writing, see http://www.usaww1.com/History-of-the-United-States-Air-Service.php4 . Sometimes the eyes tell it all. Consider the photo below. It is 15 October 1917 and Kaiser Wilhelm II is making a state visit to Constantinople to buoy up his Ottoman allies, who are feeling pressure on multiple fronts despite the impending departure of Russia from the war. 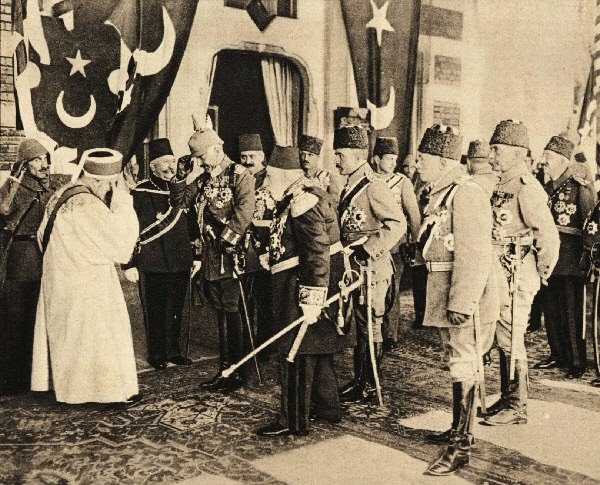 Sultan Mehmet V is exchanging salutes with the Kaiser, while to his right his successor, the elderly sword-bearing Ottoman Crown Prince looks on. Numerous senior court officials and military officers hover around them solicitously. The dominant figure for the Turks, however, is the chap at the far left, dressed in the simple army field uniform, the one intensely and critically studying the Sultan. Only 35 years of age, he appears to be both the youngest and most junior individual present, but he is the one standing closest to the Sultan, monitoring every utterance of both monarchs. He is the man in charge. This is Enver Pasha, the most important of the three colleagues — the "Three Pashas" (honorific chiefs or lords) — who emerged to lead the reform movement known as the Young Turks and, by 1913, to command the Ottoman Empire, just on the eve of the Great War. 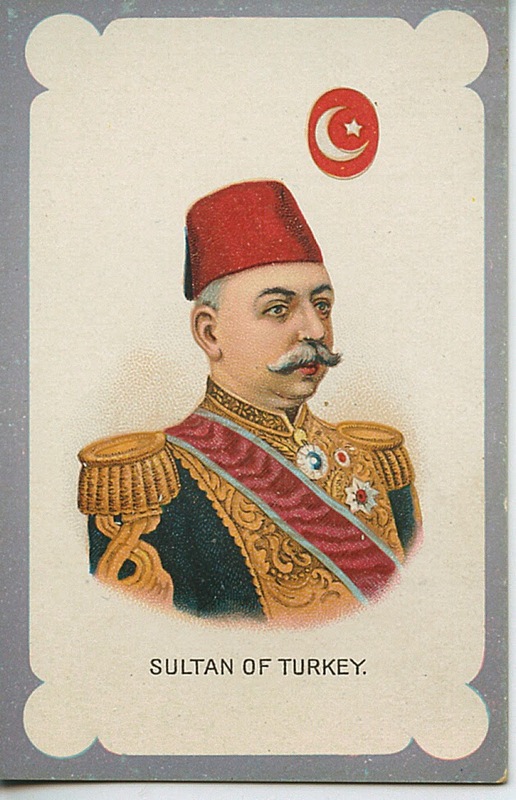 Originally the Young Turks were quite diverse, including intellectuals, civil servants, military officers, and members from religious and non-Turkish minority groups, mostly interested in restoring the empire to past glories through modernization, secularization, and parliamentary government. However, their 1908 revolt was perceived by many, both abroad and internally, as another sign of imperial disintegration, an opportunity for territorial acquisition by the big powers or for independence by separatists. The reformers found themselves besieged immediately in 1908, enmeshed with the series of diplomatic crises, the rise of nationalism, and the regional wars that directly led to the Great War. After the most militant, nationalistic wing of the Young Turks seized power in 1913, its leaders, the Three Pashas (primarily Enver), managed to bring the empire into the war — on the losing side. What Happened to HMS Audacious? HMS Audacious, commissioned in October 1913, was a Royal Navy battleship of the type known as a super(second generation)-dreadnought. 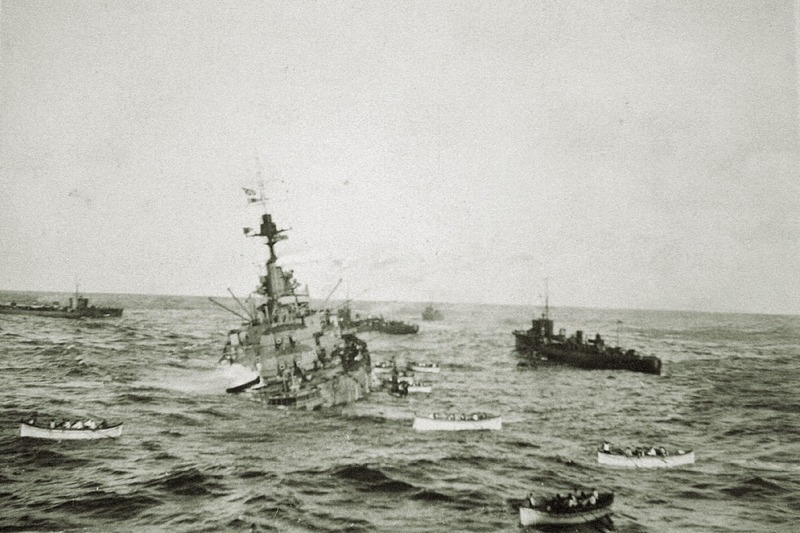 Returning to a temporary base in Northern Ireland from a training cruise, Audacious hit a mine at 08:45 off of the northwestern coast of Ireland, near Tory Island on 27 October 1914. It was a serious loss to the fleet at the time and kept largely secret since its sinking diminished the advantage marginally held over the High Seas Fleet. All the crew was evacuated successfully. Audacious was the only super-dreadnought to be lost during the war. 1. The mine was laid by the German liner Berlin. 2. The German naval command did not know about the base in Northern Ireland. 3. The White Star liner Olympic helped evacuate the crew. 4. For most of the day, the ship's listing was managed, but it steadily sank by the stern due to flooding. Eventually, though, Audacious began listing at a dramatic rate, capsizing and sinking at about 2100 hrs. 5. After capsizing, one large and two secondary explosions were heard before the ship finally disappeared beneath the waves. From an early age, author Nimrod T. Frazer knew about the 167th Infantry Regiment. His father, William Johnson Frazer, served as an enlisted man in the regiment on the Mexican border and in France, where he was wounded. An interest in the history of the regiment served as a lifelong bond between father and son; this book is a result of Rod Frazer's abiding interest in his father's regiment. The 167th, originally the 4th Alabama Infantry Regiment of the Alabama National Guard, was part of the storied 42nd (Rainbow) Division. The 42nd, an effective and popular U.S. division, has a particularly rich historiography; there are many unit histories and memoirs awaiting the interested reader. Frazer, a retired banker who earned a Silver Star in Korea, tapped into an impressive array of sources to bring us a well-written and thorough unit history. Typical of many National Guard units, the 4th Alabama was federalized and sent to the Mexican border in Arizona in 1916. Frazer describes the recruitment and training of the Alabamians and then the training and daily life on the border. A grueling road march from Nogales to Tucson in November helped the regiment develop its reputation for toughness. The 4th returned to Alabama in March 1917, just in time for the U.S. declaration of war against Germany. Upon its return to Alabama, the regiment performed guard duties in the South. Then in August it was redesignated as the 167th Infantry Regiment and sent to Camp Mills, New York, for deployment to France as part of the 42nd Division, made up of National Guard units from 26 states. Frazer discusses the 42nd's two months at Camp Mills; the various units, of differing experience and ability, trained hard to prepare for active service. Upon arrival in France in late November 1917, the 167th continued its training, and Frazer describes living and training conditions the men encountered. Perhaps the most difficult challenge was a three-day march from Saint-Blin to Rolampont, begun the day after Christmas. The men endured "heavy snowfall and sub freezing temperatures...a test of endurance and tenacity" (p. 54). The Alabamians, not used to the cold, snowy French weather, suffered terribly. The men persevered, and the result was a bonding among units in the division that proved fruitful in combat. Frazer's account of the march evokes the cold and misery quite well. 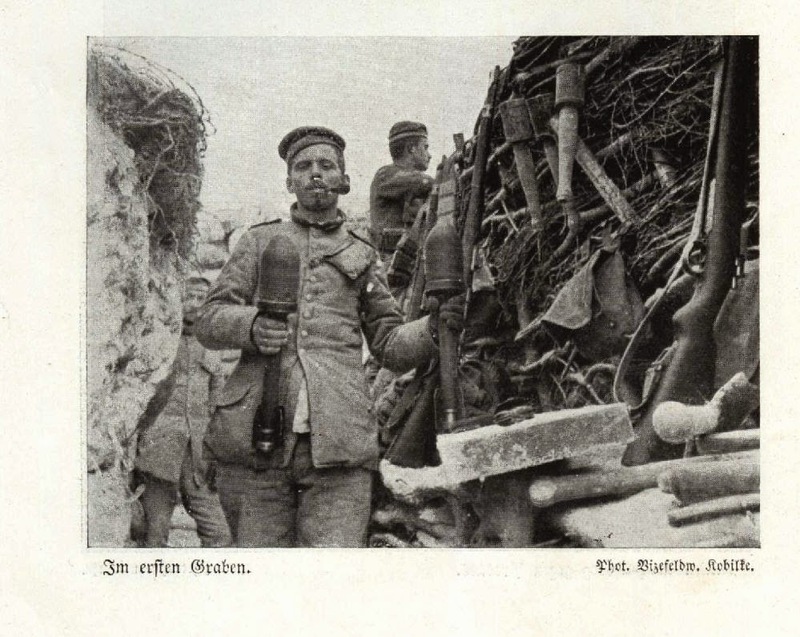 Finally, in February 1918, the regiment entered the trenches in the Baccarat Sector. Frazer's account of the 167th in combat is thorough, including descriptions of their first patrols (March 1918) and fighting in Champagne where they helped to blunt Germany's final offensive. 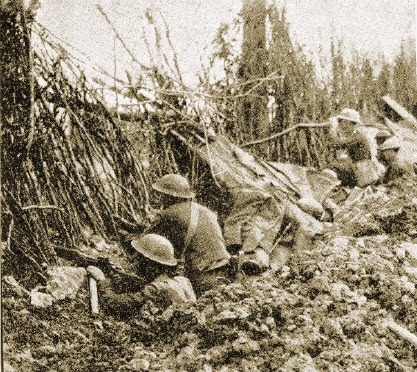 The fighting in Champagne furthered the regiment's reputation for toughness. As a soldier from another 42nd regiment said, "I do not know if they would make good parlor pets or proper chaperons for young ladies at the movies, but they sure are wonderful fighters" (p. 104). Frazer next goes into detail about the battle at Croix Rouge Farm during the Aisne-Marne action; it was here that his father was wounded. Will Frazer, hit twice in the leg by machine gun bullets, crawled into a shell hole where a French soldier "pointed to Will's leg wound and said, 'Bonne blessure'" (p. 122). It was indeed a "good wound" for Frazer as he was evacuated to a hospital near Paris. Of course the 167th was nowhere near done fighting. Ahead loomed the fighting on the Ourcq, the St. Mihiel Offensive, and the bloody action during the Meuse-Argonne Offensive; the division also served in the Army of Occupation. To all of this, and the regiment's "triumphant" return to Alabama, Frazer devotes great attention. Frazer's brief, poignant epilogue recounts his father's struggle with alcoholism. His father's best friend and fellow 167th vet, Chester Kirk Scott, himself battling alcoholism and reeling from a failed business, committed suicide after telephoning Frazer's father, who arrived too late to stop Scott. This is a stark reminder of the ghosts and memories that haunted Doughboy veterans. Frazer secured the services of a professional cartographer to produce the kind of maps that many readers, including this reviewer, enjoy — highly detailed, with some maps showing small units such as battalions and companies. The author has also included a roster of Alabama men who were present with the regiment at Camp Mills. A number of fine photographs further enhance the book, and a World War I chronology with the 167th's history incorporated within is a useful addition. The book is well-annotated and contains a helpful bibliography. 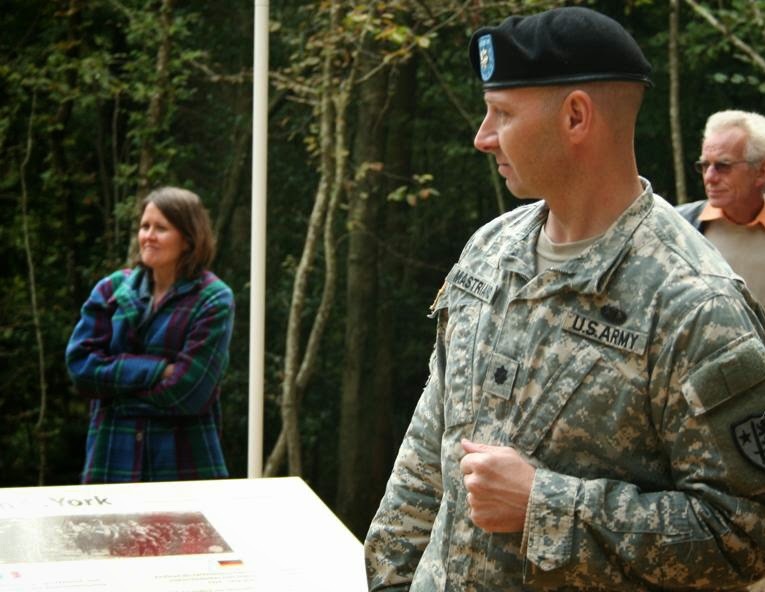 Frazer's dedication to preserving the memory of the Alabamians is so strong that he purchased the site of the regiment's battle at Croix Rouge Farm and there built a memorial to the Rainbow Division. the book's dust jacket bears a photograph of the memorial — a statue of a Doughboy carrying a dead comrade. All told, Frazer has written a solid history. It is a welcome addition to the historiography of the American Expeditionary Forces. What Was the "Knuckle Duster"?